He came to London when he was 20 to learn English, but his first job was in a French restaurant in Southgate where everyone in the kitchen spoke French. Moving on as an agency chef, he found himself living behind a fishmonger’s in Robert Street, where he offered occasional help and got seriously interested in fish. Then in November 2009 Nic found an abandoned café at the foodie end of Gloucester Avenue and, after massive clearance and renovation, opened La Petite Poissonnerie: a gleaming fish shop at street level with a fully fitted cookery school below where sushi-making and other fishy activities are taught. The kitchen classroom opens on to a well-stocked herb garden that is Nic’s pride and joy. Skin mackerel fillets, scraping away the central dark seam to expose any small bones that should be removed. Use your fingers to break up mackerel flesh in small pieces into a bowl. Drop tomatoes into a bowl of boiling-hot water, leave for 1-2 mins, then transfer with a slotted spoon into a bowl of cold water for a further 1-2mins. Drain and skin tomatoes, halve each horizontally, scoop out and discard seeds and cut flesh into small dice. Peel and finely dice red onion, trim spring onions and finely dice. Chop herb leaves very finely together and mix with diced tomato and onions. Spoon about a third of this mixture into a cup and mix the rest thoroughly into the mackerel along with the cream and most of the cracked or ground black pepper. Cut or break off lower third of the asparagus stems and drop tips into a large pan of boiling water. Cook for 45 seconds after water returns to the boil, then drain and immediately drop asparagus tips into a large bowl of cold water. Drain when cool. 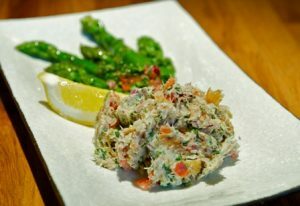 When you are ready to serve, mound rillettes on four serving plates and arrange asparagus tips and lemon wedges alongside. Mix oil and lemon juice into the reserved tomato and herb mixture and spoon over asparagus tips. Sprinkle each plate with cracked or coarsely ground black pepper and serve with crusty brown bread.